← Check out our favorite Fall Pumpkin products! October is Breast Cancer Awareness Month and we are so excited to announce that we have partnered with National Breast Cancer Foundation for the month! We will be donating 10% of sales from Doctor D. Schwab’s Lip Rescue, Rescue Cream and Intensive Hand Cream to National Breast Cancer Foundation. 1 in 8 women in the United States will develop breast cancer in her lifetime. Over 3.1 million breast cancer survivors are alive in the United States today. We hope to raise awareness and support from our amazing clientele during this month. Doctor. 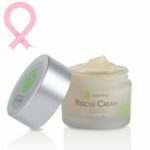 D. Schwab’s Rescue Cream – Rescue Cream is a soothing emollient cream and moisture restorer which helps to bring relief to skin damaged by sun overexposure, aggressive peels, burns or other environmental impacts, as well as dry skin suffering from the harsh side effects of radiation and chemotherapy. Active ingredients seal the skin’s surface to help begin skin healing and regeneration. A combination of six herbal extracts helps to significantly reduce blistering and calm over-stressed skin. As an ongoing international program to help those undergoing the healing process followed by chemotherapy and radiation, Doctor D. Schwab has been donating Rescue Cream to hospitals and individuals around the world. Doctor. D. Schwab’s Lip Rescue – The ultimate rescue from chapped and dehydrated lip conditions! The softening and hydrating properties of Aloe Extract, Sweet Almond Oil, and Evening Primrose Oil keep lips moisturized and supple. Arnica Extract and Vitamin E condition and soothe cracked lips, while natural Beeswax seals in essential moisture. Doctor D. Schwab’s Intensive Hand Cream – An effective hand treatment to help fade dark spots and provide maximum moisturization. A powerful blend of Green Tea and Coffee Extract and Alpha Bright Peptide helps to preserve a youthful appearance of your hands by protecting from free radicals and environmental impact. This entry was posted in Bay Area Estheticians, Ca Botana Skin Care, California Estheticians, Skin Care, Skin Care Tips and tagged breast cancer awareness month, national breast cancer foundation. Bookmark the permalink.